"Graceland University is not in Memphis TN; it's in the small, safe, pretty Iowa town of Lamoni. Just about every student at participates in intramurals or varsity sports, and the Center for the Study of Free Enterprise and Entrepreneurship "seeks to perpetuate the spirit of free enterprise in students, faculty and the community." Graceland is sponsored by the Reorganized Church of Jesus Christ of Latter Day Saints." What is a typical Graceland University-Lamoni student like? Describe the type of person that should attend Graceland University-Lamoni. What are the top 3 reasons someone should attend Graceland University-Lamoni? It is a very rewarding experience, something for everyone and the teachers are very willing to help you out! What was a typical Graceland University-Lamoni student like in high school? Describe the type of person that should attend Graceland University-Lamoni. Graceland University was established as Graceland College in 1895 by the RLDS Church (now the Community of Christ) at Lamoni, Iowa. Land for the college was donated by church members, with the first 20 acres given by Marietta Walker, after whom Walker Hall is named. Until the administration building was completed, classes were conducted in a building in downtown Lamoni. The first day of classes was September 17, 1895. There were 18 men and women students, four faculty and a dean. The name "Graceland" was given by Col. George Barrett, who surveyed the land for the college. He selected the name because of the graceful slope of the hill upon which the college was built. The first building - now the administration building - housed the complete college. It was dedicated on January 1, 1897. The church president, Joseph Smith III, said on the day of dedication that the college "should be free to all irrespective of faith or creed." Following an extensive renovation in the mid-1990s, the administration building was named the Higdon Administration Building in 1997 in recognition of three presidents: Earl T. Higdon; his son and daughter-in-law, William "Bill" Higdon and Barbara McFarlane Higdon. In 1917, Graceland received accreditation of the states of Iowa and Missouri and from the North Central Association of Colleges, making it the first fully accredited junior college in Iowa. Graceland became a four-year college in 1960. Graceland's nursing program began in 1910 in a cooperative program with the Independence Sanitarium and Hospital, Independence, Missouri. The Graceland campus was extended to Independence with the establishment of the college's bachelor's degree program in 1968-69. The physical Independence campus was located in three different sites before construction of the present building on W. Truman Road in 1999. The Graceland Partnership Program was established in 1989. Currently Graceland University offers degree-completion programs on the campuses of Indian Hills Community College, Centerville, Iowa, and North Central Missouri College, Trenton, Missouri. Graceland College became Graceland University on June 1, 2000. What are the top 3 things that students do for fun at Graceland University-Lamoni? When I was a student on campus the top 3 things that students liked to attend were sports events, house games/events, and IM games. The average student pays $16,288 for tuition, fees, and other expenses, after grants and scholarships. Total stated tuition is $23,180, in-state and on-campus, before financial aid. Learn more about financial aid at http://www.graceland.edu/admissions/financial-aid/index. Estimate the net price for you at http://www.graceland.edu/admissions/financial-aid/grants-loans-and-scholarships/index. The typical (median) early career salary of Graceland University-Lamoni graduates is $44,900, according to Payscale. 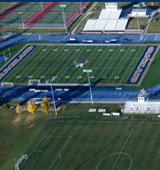 Graceland University-Lamoni participates in the NAIA Division II for college athletics. Want more info about Graceland University-Lamoni? Get free advice from education experts and Noodle community members.